We are a renowned Insulating Stool Suppliers in UAE, involved in offering a wide selection of Insulating stools. Insulating stools have legs of glass or some other nonconductor of electricity and are used for insulating a person or any object placed upon it. We are offering a wide selection of Insulating Stools, available in a variety of sizes and shapes. Insulating Stools that we are offering to the customers of Gulf Countries are made of high impact copolymer polypropylene. 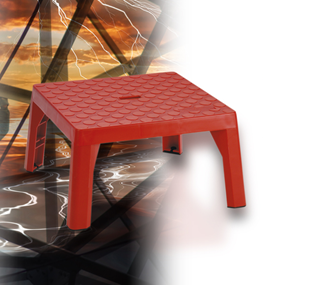 These stools are carefully designed and structured to offer safe work environment. The platform surface is largely rough and non-slippery, and the rubber tips placed under the legs gives it adherence to the floor. Being a reputed supplier, we are capable of rendering even the bulk orders for Insulating Tools all over The UAE at competitive market prices.